At this time of year I love a good homemade soup. It is a perfect, warming lunch for a cold day. I often look in my fridge and use whatever needs using. Soups are a great way to use up any vegetables that are starting to get beyond their best. On this occasion I had a lovely butternut squash and some leeks. 1 - Bring a litre of water to the boil. 2 - Once the water has come to the boil add the chopped vegetables and 2 vegetable stock cubes, bay leaves and parsley. I like to use fresh herbs out of our garden but you can use dried herbs if you do not have fresh. 3 - Bring to the boil and then simmer for 15 minutes. 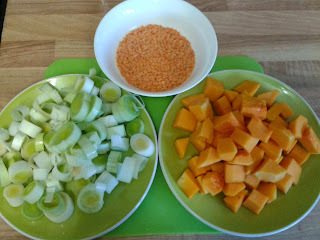 4 - Rinse the lentils and then add to the vegetables and stock. 5 - Continue to simmer until the vegetables are soft. 6 - Once the vegetables are soft remove from the heat and allow to cool before blending into a soup. I love the addition of lentils in this soup. They add thickness and so much flavour to the soup and not to mention the added nutritional benefits! 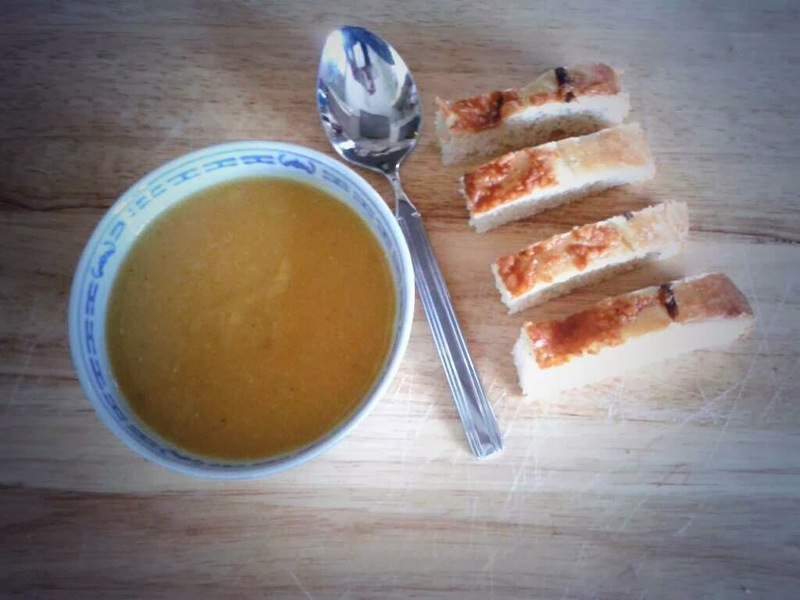 This soup is delicious served with some freshly baked cheese and red onion focaccia, fresh bread or croutons. It is perfect on a cold winters day! I have shared this recipe on A Mummy Too's Recipe of the Week take a look, there are so many yummy recipes!